Teeth whitening is the perfect way of erasing all surface stains and discolouration to reveal a brighter smile. 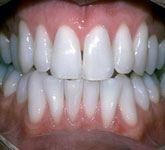 Hillview Dental Centre offers an exciting range of whitening treatments to lighten your teeth and restore your confidence in your smile in Catford and nearby Eltham area. 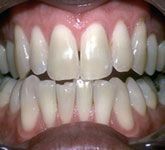 Genetics play a large part in the colour of a person’s teeth. Smoking, bad dental health, and drinking tea, coffee, and red wine are the main culprits of staining. Teeth can also be stained intrinsically (under the surface). Intrinsic stains are caused by cracks in the enamel, tetracycline antibiotics, or a high exposure to fluoride during child development. What whitening treatments are available? A whiter smile can be achieved in as little as two or three appointments. Your dentist will take impressions of your teeth to custom-make your mouthpiece, which will be filled with a bleaching gel. You will wear your mouthpiece at home for several hours a day as directed by your dentist. A powerful treatment, laser whitening can brighten teeth by six shades. Bleach is applied to your teeth before a laser light is used to activate it. You will have whiter teeth in just a single appointment. Enlighten whitening is the only treatment to guarantee the lightest B1 shade. You will use an at-home bleaching treatment for two weeks before having an in-office bleaching session with your dentist. Teeth can be whitened by up to eleven shades with this revolutionary treatment. A whitening gel is used along with the Advanced Power Lamp to eradicate stains and discolouration. This treatment targets intrinsic stains within your teeth. Your dentist will apply bleach inside your tooth and use a temporary filling as a seal. You will be left with the filling for several days as the treatment takes effect. Non-vital whitening can be repeated for stronger results. The cost of teeth whitening would be same for both ares Catford and Eltham. Your teeth whitening treatment cost depends on what work needs to be done and what system you have, along with your individual case. Your dentist will discuss the cost with you at your initial consultation. Professional teeth whitening in Catford can last for at least three years. Good dental health in combination with a healthy lifestyle can help prolong your results. Your dentist will talk to you about the longevity of the results before your treatment. You also have the option of re-whitening your teeth. Your dentist can do this in-office, or you can be given a custom-made mouthpiece and whitening gel to do it yourself at home. You can discuss your options with your dentist. Which whitening treatment is right for me? The best teeth whitening treatment for you depends on your individual case, and will be determined at your initial consultation with the help of your dentist. Are you interested in teeth whitening? Book an appointment with Hillview Dental Centre at Catford SE6 today!